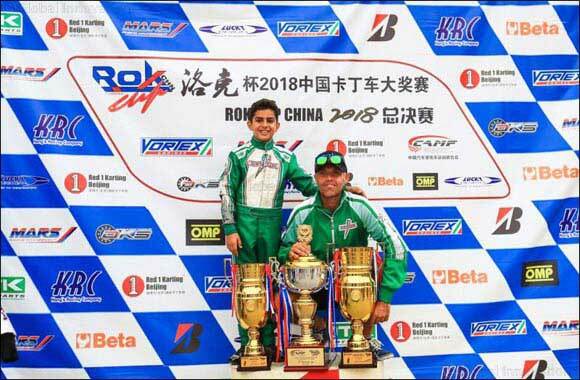 Abu Dhabi , UAE, 04th September 2018: The young Emirati karting star Rashid Al Dhahiri, made his debut in the ROK Cup Championship, China in the mini class on the 1st - 2nd September on the Red 1 International Circuit for karting in the Chinese capital Beijing. Despite the challenging and highly changeable weather conditions Al Dhaheri and his team triumphed on the ring, which required changing the tires as well as the strategic plan during the race. On day one Al Dhaheri qualified fastest to take pole position and remained in the lead throughout the race, maintaining his speed to take first place comfortably. However, despite this excellent start, in the final race of the day, Al Dhaheri was forced into second position by a competitor where he remained till the end of the race. On the second day Al Dhaheri came in fifth place during the warm up race due after struggling with grip as a result of the rain and tires. In the first heat on the final day the Emirati champion quickly rectified this moving from fifth to third, and then taking pole position in the final laps of the race despite the race despite the extremely wet conditions. In the final race of the competition Rashid started in first position and drove an impeccable race, extending his lead throughout the race to cross the finish line in a comfortable first place and to record his first victory at the Red 1 International karting race in his first participation. 'I was particularly impressed with Rashid's capacity to rapidly adapt to the changeable weather conditions and setting up the kart to get the pole position very effectively. This shows how he has evolved with experience and drives with a maturity beyond his age,' concluded Ippolitti. Al Dhaheri will return to action for the Italian ROK Championship in Adria - Italy on 7-9 September 2018.